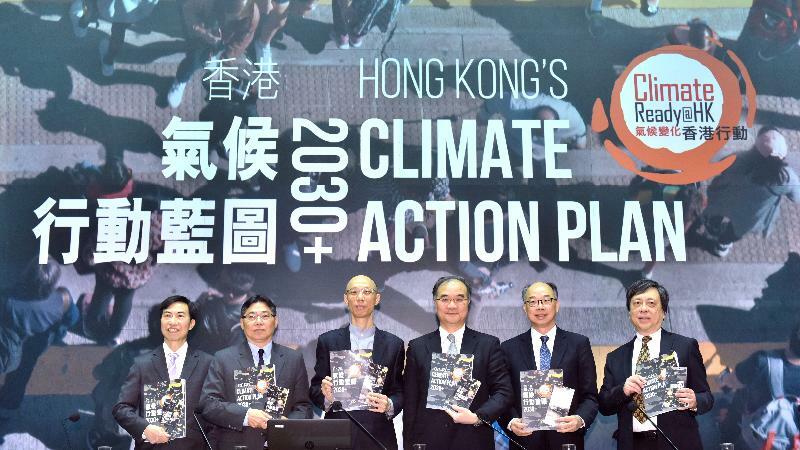 The Government announced today (January 20) Hong Kong's Climate Action Plan 2030+, outlining the Government's longer-term action in combating climate change and setting out the carbon emission reduction target for 2030. 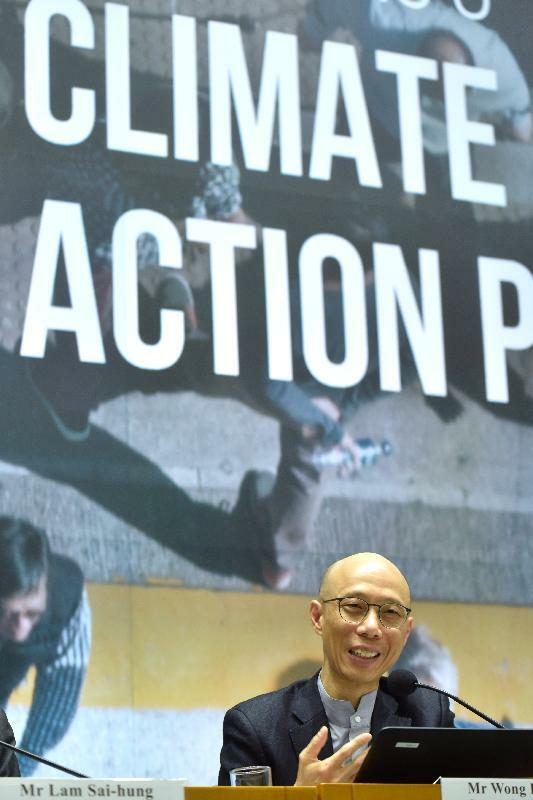 The Secretary for the Environment, Mr Wong Kam-sing, said, "The Steering Committee on Climate Change (SCCC) chaired by the Chief Secretary for Administration has worked very hard in the past year. It has examined relevant experience in other places; reviewed the scope for enhancing our local mitigation, adaptation, and resilience actions; convened the Climate Change Stakeholder Engagement Forum to tap the views of stakeholders from different sectors; and collected views from the public so as to come up with a carbon emission reduction target for 2030 and relevant action plans. Many useful insights and perspectives, as well as commitments, have come from bureaux and departments, relevant stakeholders and the public. The Chief Executive has already accepted the SCCC's recommendations and relevant implementation measures and announced the gist in his Policy Address released this Wednesday. "As highlighted by the Chief Secretary for Administration in the Action Plan, climate change is a cross-sector, cross-domain subject. As a member of the global village, Hong Kong needs to respond proactively. The current-term Government has set up the high-level Steering Committee on Climate Change to steer and co-ordinate efforts among various bureaux and departments in combating climate change and achieving carbon reduction targets, and encourage everyone in the community to participate actively in this cause to support an energy-saving, waste-less and low-carbon lifestyle." The Government's target is to reduce Hong Kong's carbon intensity by 65 per cent to 70 per cent by 2030 compared with the 2005 level, which is equivalent to an absolute reduction of 26 per cent to 36 per cent and resulting in per capita emission of 3.3 to 3.8 tonnes in 2030. It is also anticipated that carbon emission will peak before 2020. Mr Wong added, "We will reduce coal-fired electricity generation, apply renewable energy on a wider and larger scale, make our infrastructure and buildings - both new and existing buildings in the public and private sectors - more energy efficient, improve public transport and promote walking as a mobility means, strengthen the climate-readiness of the city as a whole, 'cool' the city through measures such as wind environment and landscaping design, and partner with stakeholders so that our community can be climate-resilient in the long term." He stressed that while changing the fuel mix is an effective means of achieving the carbon reduction target, the general public have to be prepared and accept the tariff impact arising from such a change. TV and radio Announcements in the Public Interest, a poster and a new Climate Ready website (www.climateready.gov.hk) have been launched today to enhance the message and raise public awareness on the importance of combating climate change. Hong Kong's Climate Action Plan 2030+ and a leaflet can also be downloaded from the Climate Ready website. In addition, the Government has proposed to step up publicity including setting aside $10 million from the Environment and Conservation Fund to subsidise non-profit-making organisations to carry out public education activities and demonstration projects on climate change. The Government will proactively take forward measures to combat climate change and work with different sectors of the community and the general public in various ways relating to clothing, food, living and travelling to pave the way for low-carbon living that saves energy and follows the "use less, waste less" principle.